Hello, all of you ribbon lovers! 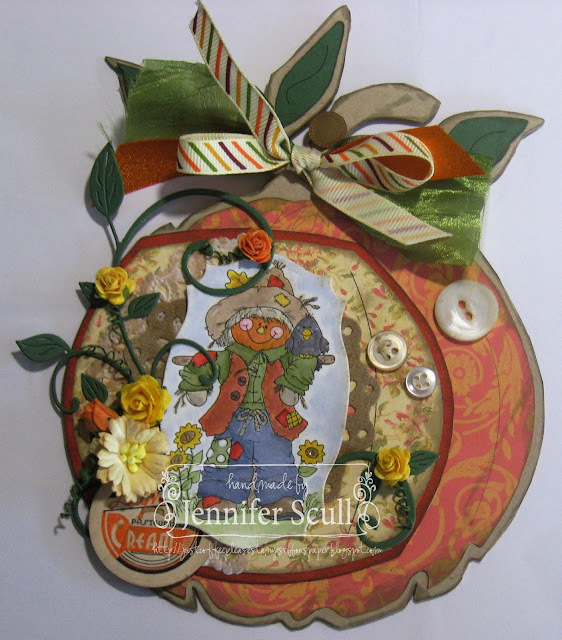 Today I have a cute pumpkin shaped card to share with all of you. It's actually part of a gift set. I'll be sharing the other portion with all of you next week. Have you ever cut the tail from one side of a bow that was just a smidge too long? Yes, I save those. Or maybe you have a piece a few inches long from the beloved piece of crochet trim that started out many yards long, but you've been using portions and parts on specials projects. I keep all of those pieces on my craft desk so that they can come to life again in what can easily be called 'shabby bows'. Just gather the small pieces and tie them into your bow. It's so easy to do, but adds such a pretty, shabby chic look to your project! Here I have used the Autumn Diagonal Stripe Grosgrain to tie pieces of Silky Crush Olive ribbon and Tangerine Shimmer Satin with Gold. I also added a variety of flowers by Wild Orchid Crafts - cosmos, 10mm open roses, and 15 mm open roses. You can find more information about this card on my blog, "Just Coffee Please..."
Super cute! Love the shape and all your ribbons and flowers! So cute ...I just love that pumpkin!! !